Chief Minister of Karnataka Mr. B.S. Yediyurappa has allocated Rs. 1 crore as the state governments financial assistance to India's most unique and perhaps only one of its kind "Janapada Loka" the folk art museum complex near Ramanagaram (just 50 kms from Bangalore). Dr. Chakkere Shivashankar, Secretary of Karnataka Janapada Parishat which is maintaining the Janapada Loka has put out the parishats plan to utilize the funds. 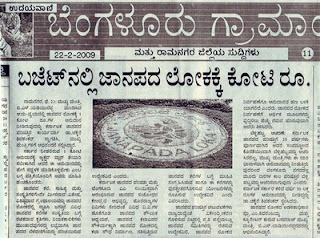 The same is published in Udayavani dated 22nd February 2009.